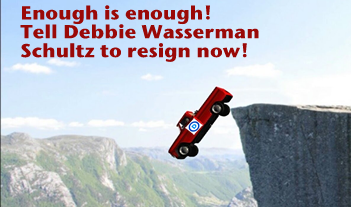 Debbie Wasserman Schultz has finally driven the Democratic National Committee off a cliff. The DNC has removed restrictions on "donations" from federal lobbyists and political action committees. The move could bring big donor cash into the Hillary Victory Fund, a joint DNC/Clinton fundraising committee, but it is guaranteed to turn off many voters. Resign as chair of the Democratic National Committee. 17864 3.1 years ago Marilyn Rowland Ithaca, NY Not long ago, I admired Debbie. Now I cannot tolerate her! WHY? Her tenure at the DNC is a sham and a joke! She seems to think Hillary Clinton should be elected QUEEN of America! NO! I'm for Bernie! 17862 3.1 years ago Anonymous sandy, OR Aren't you the greedy one. 17858 3.1 years ago kathryn weston encinitas, CA This Primary Election has exposed to corruption that is currently the DNC.